To my knowledge, this is the first representation of a vampire transforming into mist in Magic. That seems to be a less compelling element of vampire mythology than others; it's rarely used in other settings as well. For example, Buffy the Vampire Slayer seemed to feel that it was an ability unique to Dracula (who they also misused and underused, but that's a story for another time and place). There's little your opponents will be able to do to stop this creature in combat. Something like Rebuke won't even work as long as you have mana up, though it will prevent the damage if they wait until after you used its unblocked trigger and flipped back (forcing you to flip again). I assume things like this are why the main Wrath of God variant in this set exiles, which may turn some people off this creature, making it odd design - but that's a story for another time. Not me, though. 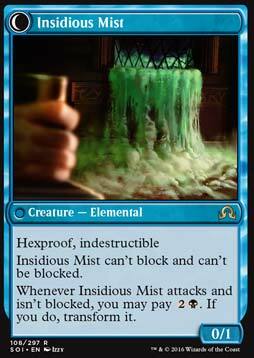 I think this is a good way to make a creature that "only" attacks and blocks be relevant and raise questions of opponents. A neat combat trick for an unblockable 4/4 hit, though it's really expensive. sure, it enables madness, the idea of an unblockable hit is intriguing, but there's menace, and that can be effectively unblockable. there's deathtouch. hell, the original unblockable, flying. there's so many other, better options, I can't recommend this. Flavorwise, it's neat, I like the design, but the overall playability is tantamount to a 0 across the board.